A nationwide apparel company needed to overcome a challenge that is often faced in the retail industry: incorporating a backroom storage solution to house multiple products while also being able to accommodate seasonal inventory. The company partnered with REB in 2009 to provide them with rivet shelving for several of their locations. 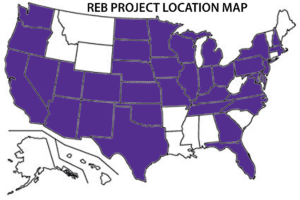 As the company has grown over the course of a decade, REB has provided rivet shelving to numerous locations in 35 states across the United States. REB’s project management capabilities and manufacturer relationships have allowed REB to grow with this company, providing shelving at cost-efficient pricing and fast lead times, no matter where in the US it’s needed. After a number of years providing rivet shelving, the company expressed concern regarding employees picking the product from the shelves. They felt they were losing valuable time with their current stocking and picking method. REB analyzed their operation and suggested a type of ladder that would pair well with their shelving systems as well as the small space available in the backrooms. The ladders are constructed for narrow spaces and are attached to a track that spans the shelving units. This provides an easy way to access inventory and allow for swift picking and replenishing. Because REB has the capability of coordinating with rivet shelving manufacturers across the US, the company has been able to have one point of contact for complete coordination of their backroom shelving requirements as they’ve expanded into new states. This has provided the company time and cost savings. The ladders suggested by REB enables product to be stocked and easily accessed which decreases time spent on locating inventory. The narrow frame of the ladders helps provide access in narrower spaces, giving more room for storage. Do you need a material handling solution for your retail backroom? Your retail backroom can benefit from incorporating the right kind of storage system that allows for high storage density and easier product accessibility. Material handling products, like ladders, picking carts and containers can be incorporated to also help expedite stocking and replenishing while decreasing the time spent locating inventory. For more information on shelving or material handling products, or to get in touch with one of our industry experts, fill out the 'Submit Your Inquiry' form.